Skyscript.co.uk :: View topic - will i go overseas within 6 months? will i go overseas within 6 months? Posted: Tue Mar 16, 2010 8:06 pm Post subject: will i go overseas within 6 months? i got tax refund finally! So since my frequent miles is about to expire i got a great deal on a travel package and with good exchange rate, i decided to take 2 week break. So i asked "will i go overseas within 6 months?" right off the bat, the chart is radical. moon is in 9th house (house of travel and it represents me). What i do see is very mixed . William Lilly writes in a reference to a perfection by a conjunction "if in cadent houses with infinite loss of time some difficulty and much struggling" but this is 9th house issue does this rule apply? Another worrysome issue is South node on Asce but Sirius a royal fix star there as well. Moon peregrine - yeah i will be out of my non-english speaking country. I am def not going within 2 months cause i am working on a project that needs to be finished first. I am not clear on timing here even though it is less than 2. But then moon and jupiter are combust, so i am not sure if it is a good idea at all! You are planning on going? Do you think something else will get in the way, or are you just wondering if it would be a good trip? Sirius on the ASC might help fight the SN conjunction. Moon/Jupiter are both trine ASC and receive the ASC by domicile/exaltation. The trip itself is Jupiter in domicile, which seems like a nice, romantic and exciting trip to see and discover new and foreign things (9th house Jupiter), it's just that other matters may be more pressing, and you might be day-dreaming (Pisces) about something you don't have a lot of intention to do (Moon peregrine/cadent and applying to combustion). Two angular malefics usually show something that gets in the way, and Saturn in particular on the 4th cusp, and the 4th ruler is in detriment (though cazimi?) and applying to oppose, might signify family or domestic issues or something at home that needs attention. Mercury on the other side of the Sun might not be "seen" by the Moon, so you don't see what issue this is ahead of time. Saturn is also the 7th/8th ruler, which could be a spouse that doesn't think it's a good idea, or maybe you have debt (8th) that you should pay off instead. I take combustion as greater than 8.5 degrees, especially for the superiors (Jupiter) in separating aspect from the Sun (which is less damaging than application - though the Sun's beams are there). Though, the Moon is decreasing in light and applying towards combustion, showing decrease. The Sun is the 2nd ruler, so perhaps it's about eating up your monies. I don't think it's a bad trip, just a sign that you might be prohibited from going for some reason, perhaps financial or domestic issues. Maybe it's just delay and you will go later than 6 months. The Moon-Jupiter aspect is cadent/mutable so it'd probably be in a yr. Moon is slow too, so it's tough to say if it would be longer. - the Moon, your significator, is in a critical condition, already under the Sun's beams at the end of its monthly cycle. - Jupiter, the ruler of the quesited matter, is also USB,although in its own sign and essentially strong...I'm having doubts that he can perform properly under these conditions. Although Moon applies to Jupiter by conjunction, they are both impeded by the Sun...SA r angular is another testimony of negative influence, possibly stemming from family/partner issues. I figured it would be a No... peregrine moon is the key here, I am powerless to get there. I would love to sneak out cause i dont want to lose the miles but ohh well ..
South Node/saturn/mars in 1st house almost never a good sign. Tanit, it is not so much about my money but more about work. Actually, it could be that i will find a house and start working on getting the banks to approve the loan for it too ... I am self-employed but also sort of work in another job. That is a totally different zoo. One gal is messing things up and they need to money to buy more equiptment. I dont want to say anything cause if i say it will be abrupt and mean....they cant cause no money there. I want to take her job and do what i do at the same time, juggling 3 jobs aint fun! I am already clocking 13-14 hours a day working + another job grrrr.. I can smell trouble already. so it is possible that she will be laid off and i get her tasks, so i am stuck fixing. I dont mind her workload but it is a lot to do in a short time. You 2 got something I didn't even see ... 7th house influence and it is a male *this girl's boss, he is not my boss * that will be stopping me. If she gets laid off, i will be stopped from going at all! so yeah it makes sense. USB planets again no good for anything. Yeah Goran you are right. I will post the chart today or tomorrow about the job dilemma. as horary and you guys were right I AM NOT going anywhere. I got into a car accident so my attorney advised me not to go anywhere until it is all settled. they estimate 6-8 months of no fly time. Thanks for the update - and I am so sorry about the accident! It seems clear that an issue would come up, but an accident wouldn't have been my first thought. I did notice Mercury behind the Sun, ruling the 4th and Saturn in the 4th with an applying opp to Saturn via important planets (I mentioned something you would not see ahead of time)... So Mercury might be the accident, since it rules over transportation? i am okay ... the guy was making illegal uturn and he has no insurance on top of that his mirror on a driver's side ws bent forward so there is no way he could have seen me. merc could make sense. It is a good thing that i didnt buy tickets. cause i would have bought them around this time. What a horary, wish they all could be this strongly indicated! With the Moon cjt. Jupiter(Lord of the 9th), as your first perfecting aspect and your lord, this horary is yelling loudly to me that you will travel or go abroad despite the combust Jupiter. Without consulting Terms, Face, etc., the lord of the matter, Jupiter is in it's essential dignity in Pisces while it is accidentally dignified in the 9th. I think you and the others contributing about the 'burnt infulence' of Jupiter have hit upon the hardships, but with that Moon placement I do not see how this would be cancelled out by the combust factors. P.S. O.K., despite all the positive things in that horary the combust and other factors according to your accident report cancel it out! 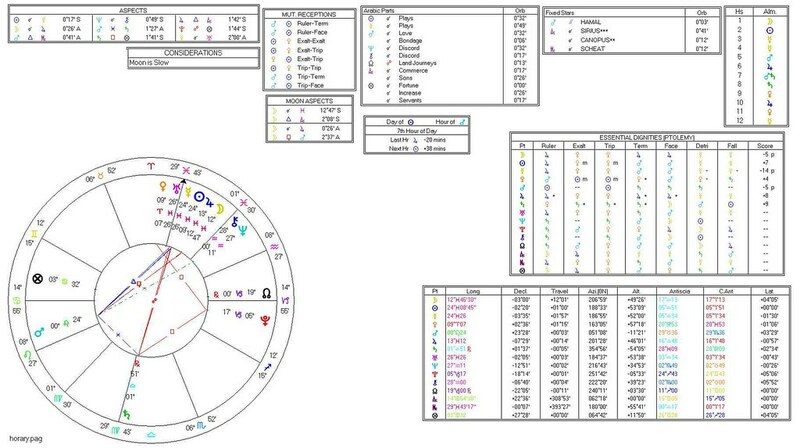 Mercury Rx currently wins out in faulty analysis! That is why it is good for everyone to report what happened. Otherwise, no matter how well we interpret, no one knows how story ended ... I DID NOT expect this accident at all! My gut feeling was a NO! South node on ascedant was a bad sign + Jupiter's condition! I kept thinking on this chart and thought others may have known a wider moeity for the Jupiter Combust as it closer to 11 degrees rather than Lilly's 8.5 degree tolerance. I can see with the Cap 7th how you need other advisers here and with Saturn lord of the 7th the consultants would have trouble too. But I think things will change within this horary as far as your court case hindering you and you will go abroad. But this is one of those difficult horarys I think where Lilly's point system needs implementing to get the correct answer.